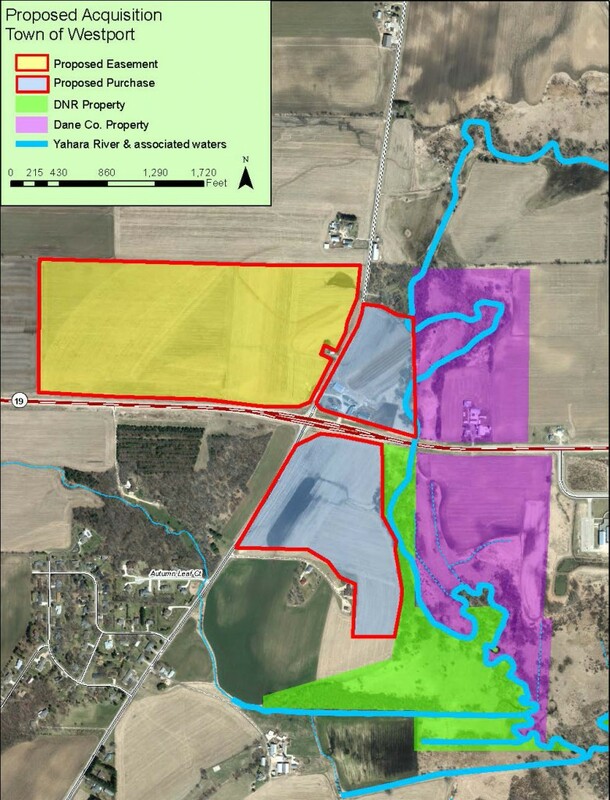 On May 18, the Dane County Board voted to approve purchasing 53 acres along the upper Yahara River and protecting an additional 77 acres just west of the purchase through a conservation easement with a local farmer. The land is in the Town of Westport, just north and south of HWY 19 at River Rd. This view shows the approved purchase looking north and east of HWY 19 towards River Rd. The land to be put into conservation easement is just beyond the farmstead. The property is adjacent to land Dane County acquired in 2015. The area is identified as a priority for county preservation in the 2012-2017 Dane County Parks and Open Space Plan. Most of the land is currently farmed and includes some river frontage and farm buildings. Restoring the farmland to grass vegetation will reduce runoff and improve water quality in the upper Yahara and its downstream lakes. The total project cost is $1.52 million. Funding will be provided by the county’s Lake Preservation and Renewal Fund. In related news, the Department of Transportation (DOT) is in the planning stages for a project to widen HWY 19 from River Rd to I-39/90 with construction to occur in 2020. The new highway will have four lanes and wider shoulders with a roundabout likely at River Rd. The project will use 2 acres of county land, and in exchange, the DOT has proposed providing a canoe landing and parking lot on the south side of the highway and a bridge with a pedestrian underpass so folks won’t need to cross highway traffic to access the north and south parcels of county land. The DOT will also plant 2 acres of native flowers along the roadway. For paddlers, reports are that the river north and south of HWY 19 is difficult to navigate due to many years of accumulated deadfall. If you are interested in helping us pursue funding to open a river trail in the area, contact us at janaxelson@gmail.com or (608) 215-0426. County Parks has been working on plans for the land acquired in 2015 just to the east of this year’s acquisition. According to County Parks Director Darren Marsh, a portion of the land will be planted to cool season grasses in cooperation with the U.S. Fish and Wildlife Service. Also in the works are plans for a restored savanna with oak plantings and a 4-5 acre pollinator planting. On receiving a permit from the DNR, the county will remove an old, caved in bridge on the north side of the property. This entry was posted in Cherokee Marsh by admin. Bookmark the permalink.